Trying to stay in shape? It’s a constant battle for many people. Everyone’s looking for magic videos or exercise equipment, that will help them lose weight and keep it off. In addition to losing weight though, your focus should also be on getting fit. They aren’t the same thing. Getting your heart rate going to a point where it’s working harder than usual, and doing that a few days a week, contributes to overall health. There’s one great tool to help you do that and monitor your progress – a heart rate monitor. Heart rate monitors, or HRMs, tell you how fast your heat is beating. You wear it during a workout and it helps you track how strenuous your workout is, helping you make sure it’s strenuous enough to improve your fitness level. One way to use it is to calculate your maximum heart rate, and then try to keep your heart going in the zone of 65-80% of your max for at least thirty minutes during a workout. There are multiple variations of this way of targeting our heart rate, depending on the level of fitness or training goals you’ve set for yourself. But keeping your heart working is key to increasing fitness levels. You want to work harder than usual in order to see the benefit. 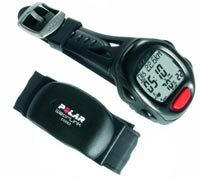 One of the tools that makes this easier is a heart rate monitor watch. This puts an HRM device on your wrist, so you can easily see the numbers as you’re doing your workout. It’s perfect for runners, hikers, and even swimmers if you get a waterproof version. There are also versions for bicyclists, but these usually mount on the bike, not your wrist. Thanks for this article. I emailed this webpage to a friend who just started running to get in shape!